Search using your location is extremely helpful while on the go. Today, we’re excited to announce Meow Me Now, a new feature that lets you find the kittens that are near you. 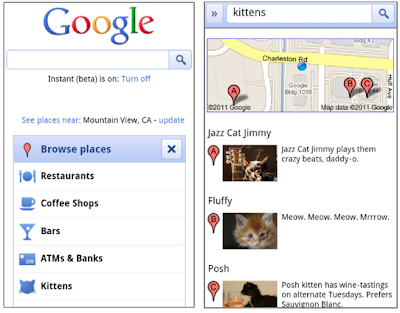 You can find kittens either by searching for [kittens] on google.com on your Android or iOS device, or by using the Near Me Now drop-down feature on the Google homepage. Voice search to locate nearby kittens will also work on Android devices, and iOS devices with the Google Search App, so try meowing into your phone to find the kittens near you. Just remember, don't Meow Me Now while driving. The results could be disastrously adorable. A dream come true. Kitty on! This will be useful in my quest to stomp on all kittens. There are obvious privacy implications for this new technology. Consider removing your cat's collar before letting it out of the house. Meow you know why I had to comment on this. No one here referenced Super Troopers yet. Meow you should all be ashamed of yourselves. Stop laughing right meow! You've been warned. Meow carry on. Hmm, so many kittens, yet so few recipes!! a similar technology could be used to find and kill mice! want to know who owns netlog.com or any other website ?